If I were to choose an ideal space for my planned house it would be in an area that is free from any barrier that would limit its functional space. But I know that there would still be somehow a dilemma in building houses. Specifically, let’s just say; the chosen area is situated in a steep slope with a live oak tree in the middle, you’ll probably ask yourself if there will be a remedy on this obstacle. The good news in here is; with the help of intelligent designers and architects, without a doubt you’ll still get to achieve a house where everybody gets to enjoy a happy home. 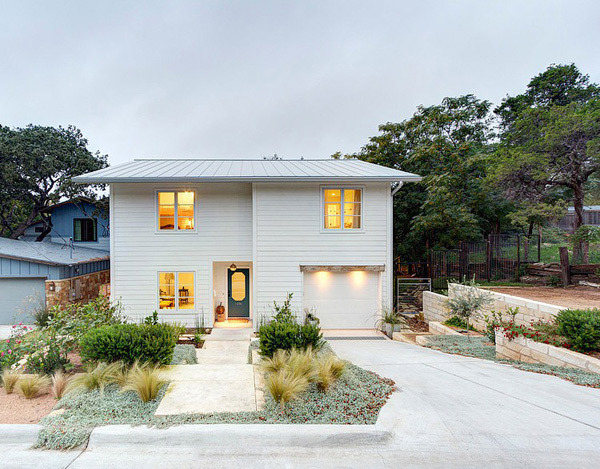 This home in Bouldin Creek Austin, Texas is owned by Kelly and Carlos Gonzales. It has an area of 3,695 square feet (343 square meters), a very narrow space for a dream house to be, but with little issues like; a complicated lot in a steep slope, a problem with eroding stream and above all a big oak tree, that has made the homeowner seek a help. The home takes the weight off from a wharf buried 40 feet into the ground to prevent from creek erosion and flooding. And the solution to the live oak tree was a very clever idea; designers built a deck that wraps up the oak tree making the area very functional. The facade of the house blends seamlessly with its sloped landscape. To add more life into this space a deck was enfolded around the oak tree. A steep down slope of the side yard is a steer for rainwater and at the same time offers a space for play time. 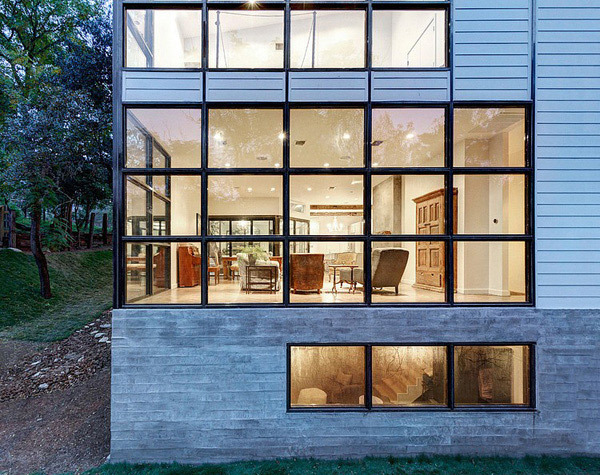 The windows are designed with a floor-to-ceiling glass frames to achieve natural light. 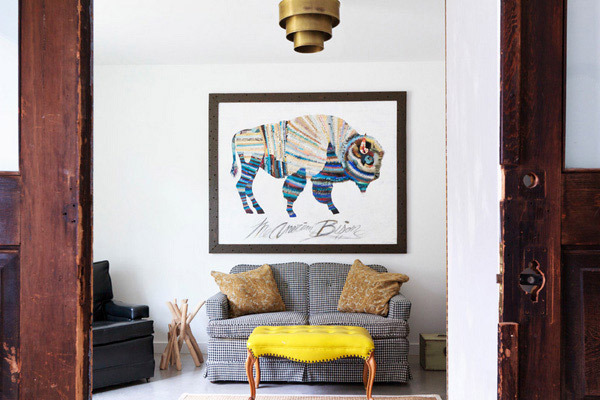 The beauty of the house is best seen in this living room, styled as modern but with a vintage touch of chairs that come together with exposed windows. 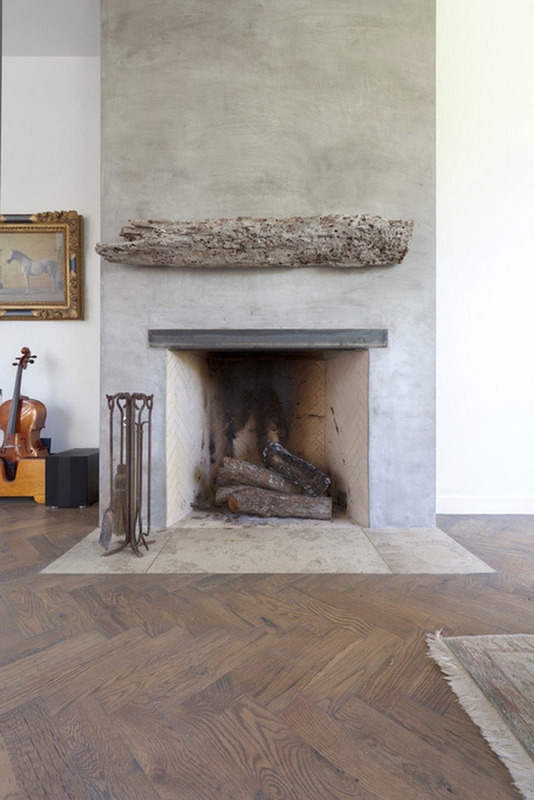 This fireplace adds more decors to the living room and also warms the other area of the house giving it an industrial feel. White is perfectly a good color for kitchens matched with reclaimed woods and chandelier. 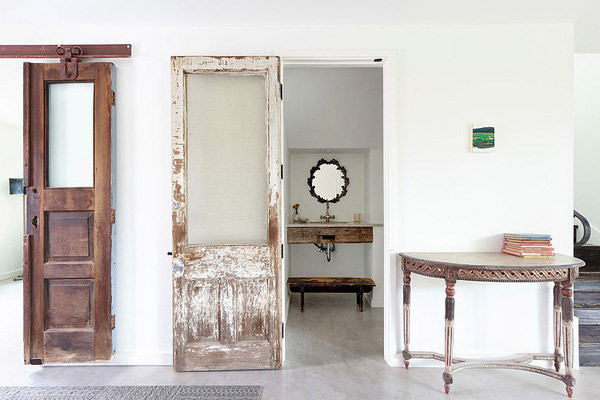 This powder room is situated under the stairs with reclaimed doors. On the left side is the way to the office. Since the father works home, this is a quiet place for his working hours. To bring color to hallways that are mostly overlooked; this serves as a reading area, with windows exposed that adds a soothing views. 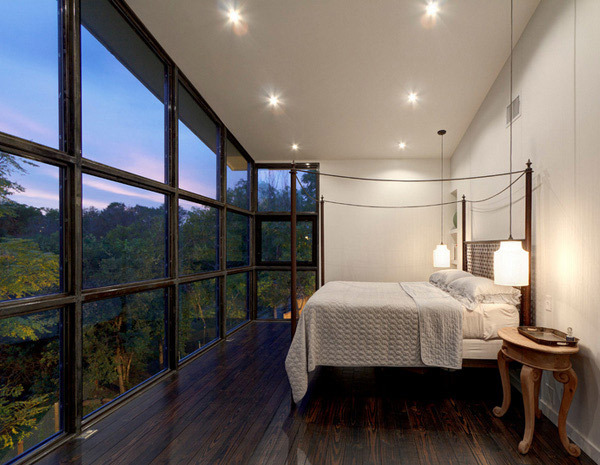 This is the master bedroom; with wide glassed windows, a simple white walls, and a view of the nature makes a very comfortable sleep. The bathroom is just behind the bedroom with an open passage. It is adorned with a tub and a modern style of shower bath. This huge room for kids is shared by three with a suspended bed to conserve space. 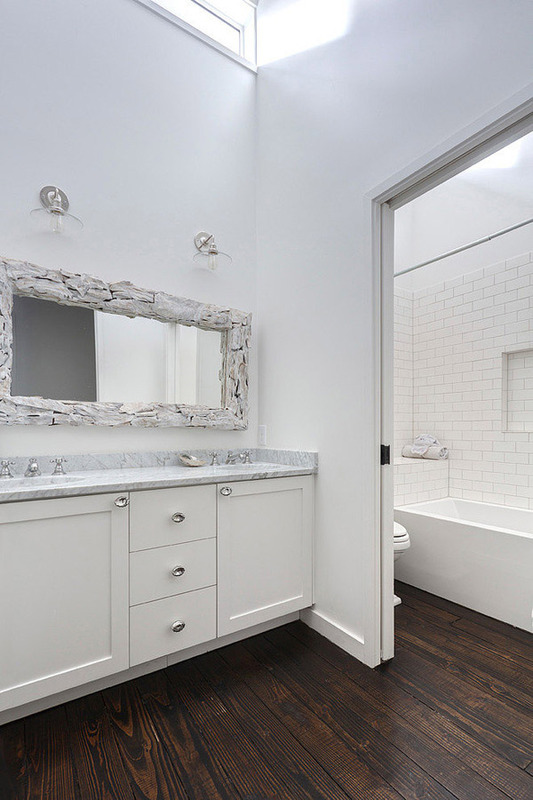 Although some would not prefer white color for it gets stained easily, personally, I suggest white for bathrooms for it brings a clean and relaxing atmosphere. 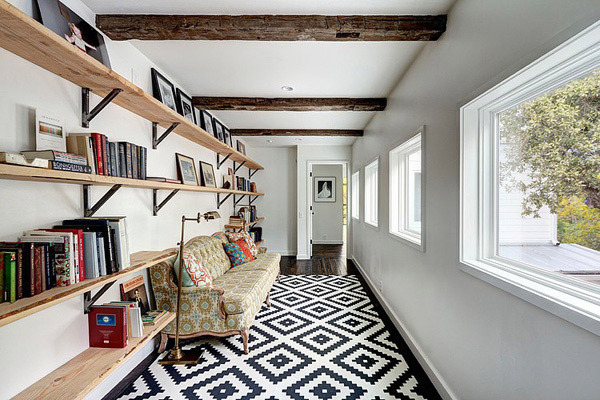 The basement is an additional idea for homeowners. 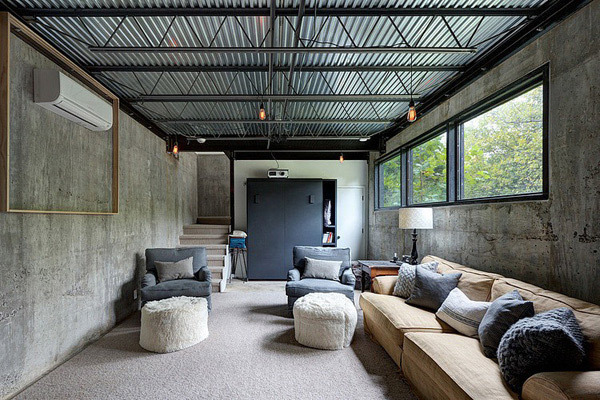 The designers created a concrete stairs leading to the first floor. This area serves a room during movie dates. Folding doors allow an easy in and out passage to the outdoor areas. If you have dilemma on cases when trees are on the center of a space, add a deck around it to make an ambiance like on parks. A very spacious courtyard with Bermuda grasses that give space for your children to play. 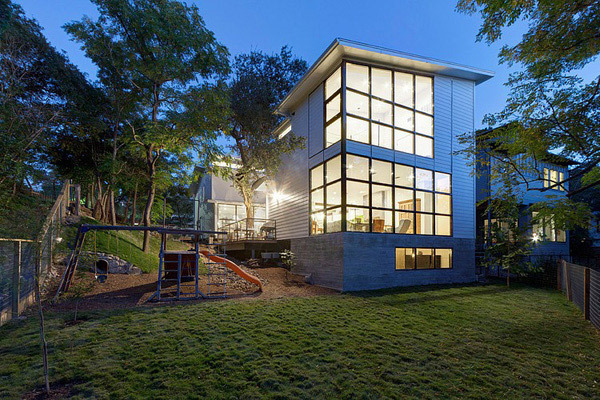 The design permit took nine months to be approved, but undoubtedly, the intended plan suites accordingly to what the family wanted. This cool residence of the Gonzales’ was a brilliant design by Silverthorn Contracting and Design together with Restructure Studio. It must have been really hard for all the people behind this work. But whatever it takes everything falls out on place. She is a simple individual who is willing to contribute concepts about design and style. She is eager to further assess her capabilities and explore her limitations because she believes that life is a process. She let the creative side in her grow which is to write, be inspired and be an inspiration.